Last week I went for my physical. Well before I left the doctors office, she informed me that my weight had gone up. Go figure.! I have been out of my kitchen for two months and have basically eaten out. How do you not put on weight? Linda I want you to loose weight. OK!! Majic wand appear. Actually I'm a lifetime member of weightwatchers. So today I went and weighted in. YIKES!!!! So I paid my dues and sat in on the meeting. Back to tracking everything that goes into my mouth.
" NO MORE CHOCOLATE" !! Then I get another call from the doctor and she asks if my kitchen is in order. I said yes, so thats the good news, whats the bad, she replys your cholestrol is high. OK I get the picture. NO MORE EATING OUT!!! Back to flaxseed, more green tea, no eggs, bacon,cheese UGH!! Well I guess this will help in my weight reduction. So to the sewing room I go. Put on my home economics hat and make a repro apron. That was interesting . 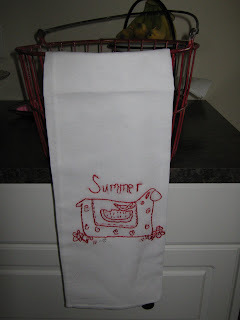 Also here is a picture of my redwork on a flour sac towel. Linda, last year my Dr. said the same thing to me...I have to loose weight. Did I loose any, no! If you find the secret to loose weight, please let me know. Lovely puppies in the background. I wish I could see the Lab's face too, just the Poodle said "Hi" to us. I also lost weight last year on WW. It is a great program and I need to get back on the wagon also. 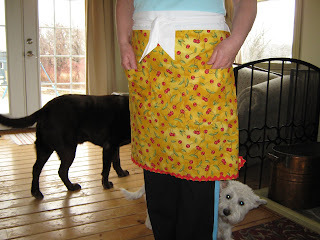 Love your apron..cute cherry fabric. And of course the pups....how cute! The redwork is just in time for some warm weather...in Ohio anyway...this weekend. I love the red work and your apron (I need to get busy on my redwork stuff - started zero). Well, I absolutely love the red work and your apron. I need to quit eating vanilla wafers. For some reason I am hooked on them. I have got to loose about 6-8 lbs. Love your retro apron. I just started a redwork quilt so yoou know I'm lovin' that tea towel! Great apron and redwork towel. I'm glad your kitchen is done so you don't have to eat out anymore.